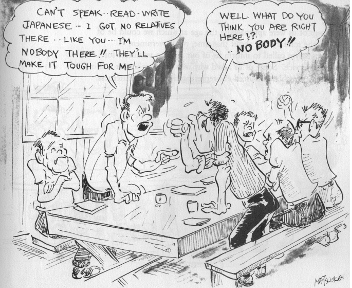 This cartoon by Jack Matsuoka shows the turmoil caused in the camps by the loyalty questionnaire. SAN JOSE — The grand opening of “Jack’s Show: His Life and Sketches” will take place on Saturday, May 11, from 3 to 5 p.m. at the Japanese American Museum of San Jose, 535 N. 5th St. (near Jackson) in San Jose Japantown. 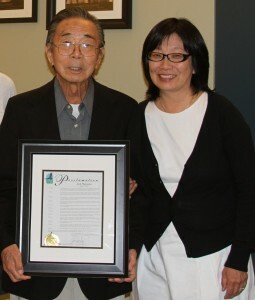 Jack Matsuoka, pictured with daughter Emi Young, was honored by the City of Watsonville in 2010. The exhibition features artwork spanning the 70-year career of Jack Matsuoka, a member of the prestigious National Cartoonists Association and a well-known figure in the San Jose Japantown community. More than 60 pieces from his personal collection will be on display, along with other artifacts from his life. Visitors will get a glimpse of history through Matsuoka’s portraits of people at work and play. His pen-and-ink illustrations reflect his passion for athletes and sports such as the San Francisco Giants and San Francisco 49ers. Also in the collection are depictions of U.S. foreign relations with China and Japan, which come alive through Matsuoka’s caricatures of political leaders. This unique exhibit celebrates Matsuoka’s joy of illustration and his deep appreciation of his friends, fans, and community. Born in Watsonville in 1925, Matsuoka demonstrated a talent and interest in drawing from an early age. As a teenager, he was incarcerated at the Poston camp in Arizona, where his visual storytelling blossomed while documenting life as an internee. He later served in the Military Intelligence Service. His book “Poston Camp II, Block 211” depicted the Japanese American incarceration experience for young readers. He also did political and sports cartoons for The Hokubei Mainichi, San Francisco Examiner, San Jose Mercury News, and other Bay Area publications. Seats are limited. RSVP required. Email [email protected] or call (408) 294-3138 to reserve a spot. Museum admission is $5 general, $3 for students and seniors over 65, and free for JAMsj members and children under 12.